(1965) "Back in My Arms Again"
"Back in My Arms Again" is a 1965 song recorded by The Supremes for the Motown label. Written and produced by Motown's main production team Holland–Dozier–Holland, "Back in My Arms Again" was the fifth consecutive and overall number-one song for the group on the Billboard Hot 100 pop singles chart in the United States from June 6, 1965 through June 12, 1965, also topping the soul chart for a week. 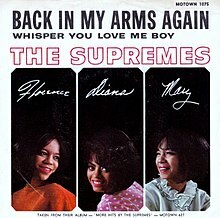 "Back in My Arms Again" was the last of five Supremes songs in a row to go number one (the others are "Where Did Our Love Go," "Baby Love," "Come See About Me," and "Stop! In the Name of Love"). The song's middle eight is almost identical to a later Holland-Dozier-Holland hit, The Isley Brothers "This Old Heart of Mine (Is Weak for You)." On the album in which this single appeared, More Hits by the Supremes, and on the official single, each member is pictured separately on the front cover, with her signature above it. The Supremes performed the song on The Mike Douglas Show, a syndicated daytime program, on May 5, 1965 and again on November 3. They performed the song nationally on the NBC variety program Hullabaloo! on Tuesday, May 11, 1965, peaking on the music charts in the following weeks. The song was recorded by Michael Bolton on his self-titled 1983 album and also by Canadian artist Colin James for the 1989 film American Boyfriends. ^ "Billboard Hot 100". Billboard. Nielsen Company. 77 (24): 24. 1965. Retrieved 10 May 2011. ^ Guest co-host: Zsa Zsa Gabor (3 November 1965). "November 3, 1965". The Mike Douglas Show. Season 4. Episode 43. Cleveland. CBS. KYW-TV. ^ Host: Frankie Avalon (11 May 1965). "Show #18". Hullabaloo. Season 1. Episode 18. Burbank, California. NBC. KNBC. ^ William Ruhlmann. "Michael Bolton  - Michael Bolton | Songs, Reviews, Credits". AllMusic. Retrieved 2016-09-28. This page was last edited on 19 April 2019, at 04:23 (UTC).